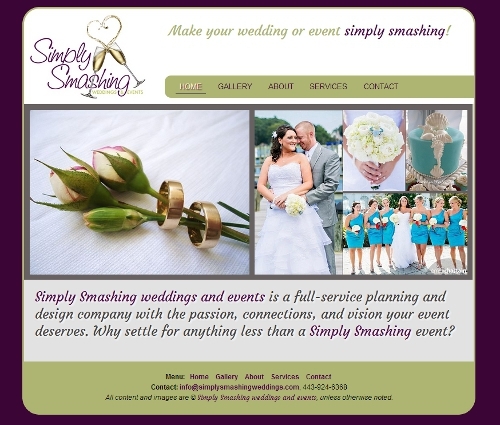 Simply Smashing Weddings & Events, an event planning company in Maryland, contacted me in August about creating their first website. They had met with a few other website designers and were baffled by the contradictory information they'd been given. Cindi Armacost, of CA Interiors, LLC, recommended they contact me. After our first meeting, they decided to hire me to create a custom website. They were looking to launch their website by October 1st. They also wanted me to assist them in developing text for their website. 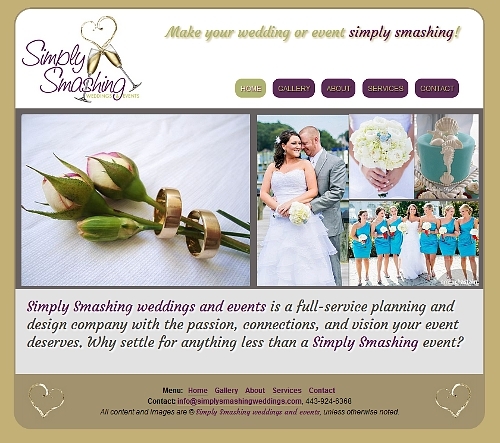 The first version of their website launched in late September. After seeing their website online for a week or two, they decided they wanted substantial color changes made. Below is my original design for this website. Though the client liked the champagne color, they felt strongly about changing the background to the purple and the footer section to green. With the increased use of color, and the increased of the green in particular, the champagne color had to be dropped. This is a great example of how the client is ultimately in charge of how their website looks: though I wouldn't necessarily have chosen the purple/green color combination, it looks fantastic and adds to the vibrancy of their website.